For most it’s a circumstance that creates inconvenience, stress, uncertainty, and unwelcome expense. And once the roadside fiasco has concluded and the spare tire is mounted, getting to the tire shop or dealer for a repair isn’t always easy. So how long can you drive with a spare tire? In the majority of cases the answer is that you should do everything possible to minimize both speeds and drive time with a spare fitted. Just how restricted you are depends on your vehicle and the quality of your spare. For everyone else, you’re most likely either working with a compact temporary spare, aka a “donut” tire, or what’s referred to as a “dissimilar/non-matching” spare wheel and tire, which is becoming increasingly common. Dissimilar/non-matching spare wheels and tires are often full-size, or close to it, but the wheel and/or tire is of a different specification than the four OE wheels and tires. 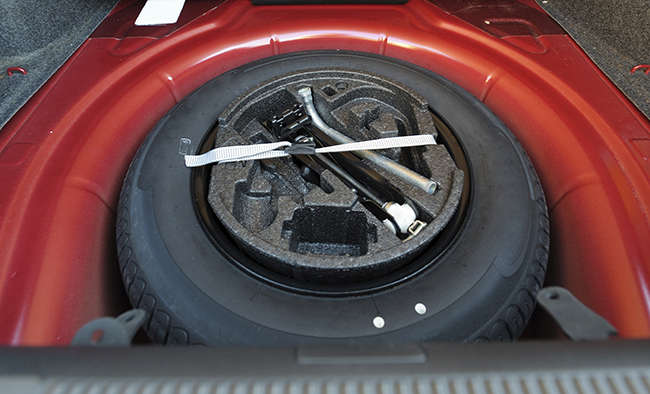 These spare tires and wheels are designed to mobilize the vehicle just long enough to get to the nearest service station. With a compact temporary spare fitted, important vehicle functions like traction control, ABS, and proper speedometer operation are likely to be impaired. The handling dynamics, braking capability, and overall traction of your vehicle will be significantly compromised. When driving, reduce your speed substantially, and don’t plan to use it long-term or over a significant distance. Check your vehicle owner’s manual for specific guidance on speed and distance limitations. The thinking behind non-matching full-size spare wheels and tires is they’re less restricted, more capable, and overall, they make the vehicle less compromised as compared to a compact temporary spare. However, the visual similarities between this type of full-size spare and the OE wheels and tires shouldn’t put drivers at ease, or give them a false sense of security. Non-matching full-size spare wheels and tires are sometimes not the same size and specification as the OE wheels and tires, even though they may seem similar. For example, the tire make and model is different, and/or the tire width might be off by a small, unnoticeable amount. If the spare is branded as “temporary,” the tire might have less tread depth than the OE tires, even when new. So here again, note that overall vehicle operation and capability will be compromised. It might not be to the same extent as with the compact temporary spare, but speeds should still be reduced, and distance traveled minimized. Consult your vehicle owner’s manual for specific instruction regarding your spare situation. In all cases, when a spare is fitted, the best advice is to not push it, drive with significant caution, and get to a service shop as soon as possible. Drive smart, be safe!